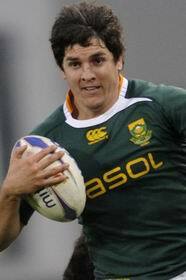 Jacque Fourie is a South African Test player who plays at outside centre for the Golden Lions and has represented his country at two World Cups making his debut at just 20 years of age. In 2008 he found himself limited to replacement appearances for South Africa but despite the setback he made a big impact off the bench the next year in the second Test at the Loftus Versfeld in Pretoria. With the Springboks trailing 22-18 with eight minutes remaining, Fourie touched down in the corner and after much deliberation from the TMO his try was awarded. A late long-distance penalty kick from Morné Steyn earned the Springboks a dramatic 28-25 win over the British & Irish Lions with Fourie having played a major part in the victory.